For over 70 years, Sonne's #18 Beet Juice Supplement has been a rich source of potassium, magnesium, phosphorous, calcium, sulfur, iodine, vitamins and trace minerals to our customers. Being that its a concentrate, Sonne's #18 Whole Beet Juice Supplement contains many other health-promoting compounds like antioxidants, carotenoids, and nitrates, which makes it the perfect accompaniment to the Sonne's 7-Day Colon Cleanse, Maintenance, and Rebuilding Programs. Recently beet juice supplements have gained in popularity as a super food due to recent scientific studies indicating the many benefits of beets and their juice. These benefits have been shown to increase blood flow and lower blood pressure, fight inflammation, aid in detoxification, and improve athletic performance. Our whole beet juice supplement, being a concentrate, is nutritionally potent. Unlike our competitors, we juice the whole beet plant (leaves, stems, and root). The extract is then vacuum dried at low temperature to retain maximum quantities of the live enzymes, vitamins and mineral factors. The Sonne's drying process does not incorporate the use of any added flavors, fillers, binders, or stabilizers - such as maltodextrin (a sugar that is used as a drying agent). It takes 200 pounds of beets to make 2 pounds of beet powder. Deluxe 7 Day Cleansing Kit. 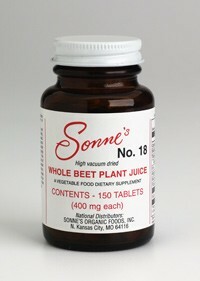 Literature: "Whole Beet Plant Juice Tablets"